Suzanne expected me to come home, but my life was here, in New York, almost eleven years of my life. Eleven years with Eddie, eleven years of working, eleven years of watching movies, making love, doing laundry, going to yoga. These things made up a life, didn’t they? And if they didn’t, then what did? So asks Carla Matthews the day she receives the phone call from home, the phone call that changes everything. 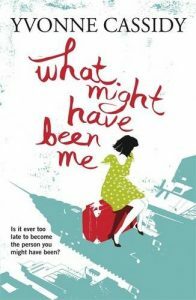 A decade before, while Carla’s friends went back to college in Ireland at the end of the summer, her decision to stay had been an easy one. She’d fallen in love – with Eddie, with the city. In New York she could write, go to the best universities, become the person she always wanted to be. Someone she couldn’t be in Dublin, at least not anymore. So why is it that after all this time she’s still working illegally, waiting tables, still watching Eddie play the same sets in the same bars? Why has she let herself grow so far apart from her mother and her sister? And how come the version of herself she wants to be seems further away than ever? As Carla grapples with some difficult decisions, she begins to understand that her reasons for staying may not have been quite as simple as she thought. And that while distance and time might let you become someone else, it takes love to come home to yourself.